Arunachal Pradesh GDP wise rank is 30, area wise its rank is 15 and population wise is has 27 rank. On the extreme north-eastern part of India, Arunachal Pradesh roughly translates into the "land of dawn-lit mountains." The state is also called as the Orchid State of India or the Paradise of the Botanists. Though sparsely populated with just 13.8 lakh people, it is the largest state in the north-eastern region with a total area of 83,743 sq km. Known as NEFA (North Eastern Frontier Agency) till 20 January 1972 when it was renamed as Arunachal Pradesh and became a union territory of India. This vast region at the extreme north-east attained full statehood on 20 February 1987. Sharing the international borders with China in the north and east, Myanmar (southeast) and Bhutan (west), Arunachal state is a bone of contention between India and communist China which considers the entire state has part of its Tibet Autonomous Region (TAR). Arunachal at the north-eastern tip of India borders Assam and Nagaland to its south. Having more than 20 tribal groups with diverse ethnicity, the people can be divided into three broad cultural identities based on their socio-religious affinities. 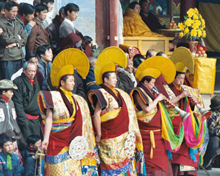 The Monpas and Sherdukpens follow the lamaistic tradition of Mahayana Buddhism. Noted for their religious fervour, the villages of these communities have richly decorated Buddhist temples locally called 'Gompas'. They practise agriculture being their main occupation, apart from breeding herds of yaks and mountain sheep. The second group of the people are Adis, Akas, Apatanis, Bangnis, Nishis, Mishmis, Mijis and Thongsas, among others, who worship Sun and Moon God namely, Donyi-Polo and Abo-Tani, the original ancestors for most of these tribes. The third group comprises Noctes and Wanchos,adjoining Nagaland in the Tirap district. They are tough people known to follow the strict rules of the village society in which the hereditary local chieftain still plays a vital role. Like in the rest of the northeast India, Arunachal tribes are descendants of the Tibeto-Burman stock of ancient origin. In recent times, a large number of migrants from various parts of India and foreign lands have been affecting the state's population. 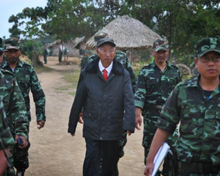 Arunachal is facing threats from insurgent groups, notably the National Socialist Council of Nagaland (NSCN), who are believed to have base camps in the districts of Changlang and Tirap. There are also reports of these groups harassing local people and extorting protection money. On the Tibetan border, the Indian army has a considerable presence due to threats from the Chinese Army which keep making incursions to remind India that this verdant land belongs to them. 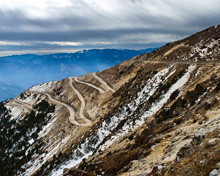 It may be noted that China's People Liberation Army (PLA) occupied the whole of Tawang and northern pockets of Arunachal after crossing the McMahon Line in the 1962 war. But inexplicably they declared ceasefire and withdrew much beyond the McMahon Line with Indian forces reoccupying the vacated areas. Now Indian army is maintaining a heavy presence all along the Line of Actual Control (LAC) in Arunachal to detect intrusions from PLA and drive back the Chinese Army so that they don't cross the McMahon Line, which serves as the de facto border between the two countries. Special permits called Inner Line Permits (ILP) are required to enter Arunachal Pradesh through any of its checkgates on the border with Assam. In Arunachal Pradesh the ratio of surfaced road length to population is up from 8 per cent per 1000 in 2012 to 11 per cent per 1000 I 2013. The state boasts that 67 per cent of the projects sanctioned under JNNURM are completed.